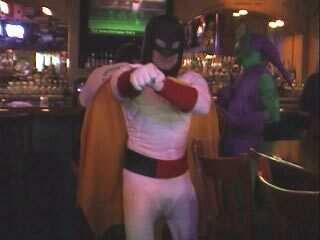 Friday night this guy in a great Space Ghost costume wandered into the restaurant where I was eating. The costume was made by a guy named Scott Crawford with a company called Alienated Products. 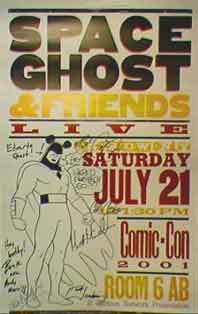 I first spotted a "Space Ghost and Friends" poster on a lamp-post outside the convention center. They were also posted outside the room where the panel was held. 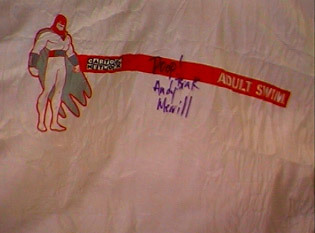 I was lucky enough to get one of the few that were left over, but Space Ghost's "friends" had some fun with his picture. At the Space Ghost/Adult Swim panel they showed an episode of the highly anticipated new series, The Brak Show. I pointed my camcorder at the screen and got a so-so recording. 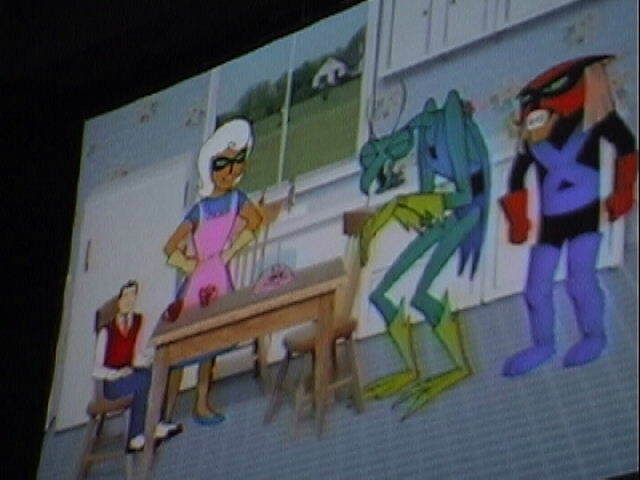 Click here for an image of Brak, his Family, and his pal Zorak. Click here for a couple of short video clips (Real Media format). During the panel they held a trivia contest and gave away CDs with music from the Adult Swim shows. 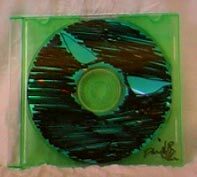 Each CD was custom-decorated by one of the guys. I won the Dave Willis original by guessing that they interviewed Merrill Markoe again. Everybody who attended got a cool Adult Swim tee-shirt. It was packaged to look like a roll of bandages that a lifeguard might carry. Here's a front and back view of the shirt design. I asked Andy to sign mine, so now it has "poop" on it. After the panel, the voice behind Brak had a special message for the Renegade Chickens.